From his opulent office on Manchester Town Hall's top floor, Councillor Andy King pulls the levers that run the city. The consummate politician for the 21st Century he always knows exactly what to say. But the public face hides a ruthless streak -- he's waiting for the right opportunity. OSPREY -- Overhead System Producing Renewable Energy is an audacious scheme to harness high-altitude wind power. Is it a breakthrough in clean energy or a far-fetched fantasy designed to extort millions? 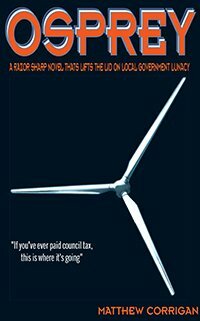 Set in recession-hit Manchester, Osprey is a brilliantly satirical novel that lifts a lid on everything from phone hacking to climate change hysteria. Topical, controversial and worryingly believable, OSPREY is a tale of panic, greed and people on the make.